Today my 11 year old daughter and I attended our second march against our current government – March in August organised by March Australia – due to its marginalising decisions for Australians and their seeming complete inability to see the big picture. Today was about many things for her and me – climate change, education, women’s issues – but we personally marched for those seeking asylum; how the horrors they have lived and seen are somehow considered null and void because they came here by boat (and after a particular date) and must logically be punished for it, suffering endless incarceration. My daughter excitedly announced that she wanted to make her own sign; she decided on a slogan and did the writing herself. It turned out being so endearing because she realised too late that she forgot the ‘s’ at the end of the word refugee and had to place it underneath. I’m so proud of her. Again. Later, whilst we watched the news on numerous channels, we were saturated with stories of global war and atrocities. That’s when our Prime Minister appeared saying he’s now committed Australia to weapons air drops in Iraq. Lots of male voices and leaders pledging more violence; more fighting. Fighting that will cause more of the displaced, who will most probably flee for their lives and seek asylum. Wouldn’t you? Not here, though. Not here. Today, however, hot on the heels of the disheartening stories and facts I listened to at the march – I read of something incredible and inspiring. 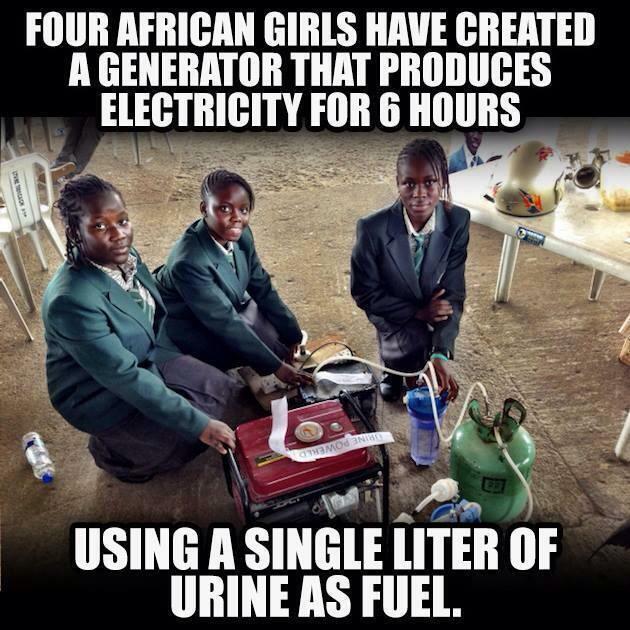 Four teenage girls from Nigeria aged between 14 and 15 years of age, created a generator that runs 6 hours of electricity on a litre of urine. Here are four human beings who see the big picture. This invention is ingenious. They used intelligence. Yet. These four humans are a part of this paradigm and hence have labels attached to them that will determine a probable dim future – they are African and they are female. Not much is going to happen with this; the ‘system’ won’t allow it. Question #210: When will the human race start to organise itself and start being intelligent about our global future? Why all the horror and injustice, just to make money at the expense of others? It’s only blacking our soul as a species. Today I marched with my daughter – heard about the continuing injustices in every corner of the globe, as well as in our own backyards – and experienced a sliver of hope. I found it curious that you based your whole response on one sentence from my post. Actually, I’m glad you did because you made me realise that I left a part off that sentence.I had just come back from an anti-government rally, protesting against their decisions and them being in bed with big businesses – at the expense of the people. My mind was thinking on that, when I wrote that sentence. As for the pro-capitalism argument – well, I’m not inherently anti-capitalism as such, because I participate in the system; under duress for the most part, however, because as the essentials become more expensive and the inexpensive comes from sweatshops with virtual slaves; I feel a pang of disgust at what cost capitalism is driven. Yes, we of the western world indulge in the comforts of invention but why doesn’t everyone have the privilege of enjoying them? I seriously doubt – from my perspective – that the motivation for the girls making their generator, was for making money; I think they were trying to create something good for the betterment of others. But if they do make money from it? Good on them. 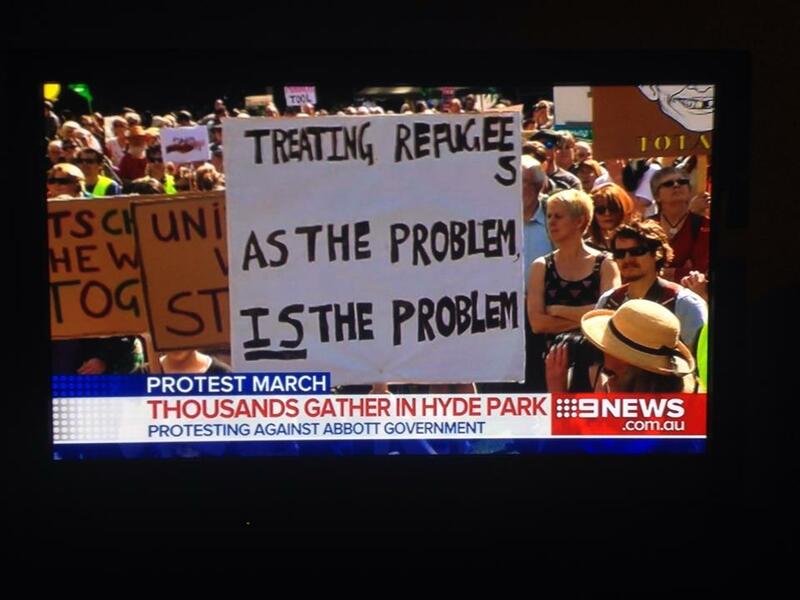 As for the asylum seekers and refugees? They just want to live a life of peace and free of pain. I think money’s the last thing on their mind at the moment.